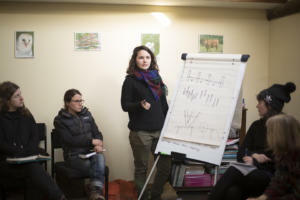 The first six months of the UK & Ireland Seed Sovereignty Programme have seen a team of 5 skilled and experienced Regional Coordinators take up posts across the country, 38 growers trained in seed production, and active participation in outreach and events reaching approximately 500 engaged growers, horticulturists and activists. Whilst the regional ‘seed hubs’ are still in the process of being established, we estimate that around 100 growers are now linked in to these 5 regions through training or variety trials. In western England, Ellen coordinated a training event on Brassica seed production led by Kate McEvoy from the Real Seed Catalogue. 15 growers representing 11 different growing sites, most of which were in the South West but also Scotland and the south east, attended the workshop in mid February. The day was a mix between the theoretical and practical elements of seed production and moved the participants on from ‘basic’ seed training to more specialist areas. A follow up is being organised for June 16th with Ben from Real Seeds on ‘Selection and Genetics’. In Wales, Katie held a ‘seed producers information day’ in April at Real Seeds as a first engagement with growers in the region. This included a panel discussion on the economics of seed production with Sue Stickland, Trill Farm and Daniel Blackburn (a current seed producer for Real Seeds). 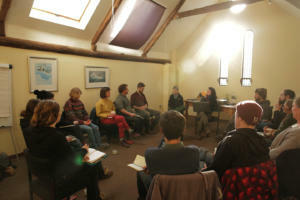 23 participants attended but more were sadly turned away due to capacity, showing the level of interest. All of these 23 individuals were new to seed production for sale, and over half were new to seed production all together. In eastern England several members of Landworkers Alliance (LWA) East Anglia have expressed interest in having a seed training day and plan to attend The Seed Co-operative’s open day on 10th June. A ‘seed crop tour’ with Peter Brinch of Open Pollinated Seeds, at his site in East Sussex, is also currently being discussed. Peter has been growing several seed crops for the Seed Co-operative this year and a tour will give attendees an opportunity to gain practical skills whilst also learning more about the demands of growing a seed crop commercially. Helen Holmes, a Seed Co-operative grower from the ‘Cambridge Crop-share’ is keen to organise a tour of their production site for commercial growers and community gardeners interested in learning more about seed production in East Anglia. In Scotland, two Scottish growers attended the seed saving training in Devon. Maria is also planning to send a Scottish delegation to the Seed Cooperative open days later this year and to join the training events in Northern England. Meanwhile, a positive connection with SASA in Edinburgh has resulted in a future collaborative training event as well as variety trials. Collaborative seed training events are also in the pipeline with the seed saver groups on the Black Isle and in Aberdeenshire. In Ireland, Wayne is currently developing a 5-day programme spanning the year, due to start at the Irish Seed Savers Association in November.